A decision aid for patients considering Hospice care. 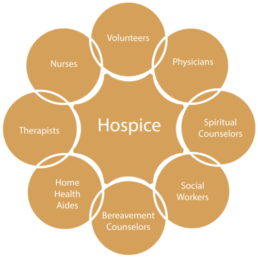 Hospice is a type of medical care for people near the end of life. Hospice care focuses on providing comfort and symptom management to seriously ill people near the end of their lives. This page is designed to help you understand what hospice care is and to help you, your loved ones and your doctors think about what is best for you. Your values and goals are the most important factors in making a decision. If I live longer than 6 months am I still eligible for hospice? Yes, You can stay in hospice for as long as your doctor believes you are showing decline. Is hospice where people go to die? No, Hospice is a treatment option for people with advanced illness who have decided curative treatment is no longer right for them. Hospice care does not aim to shorten or extend life. Are my spiritual, religious, or non-faith-based practices allowed in hospice? Yes, Hospice is non-denominational and welcomes people with diverse religious and spiritual beliefs and cultures. These traditions are incorporated into individual care plans. Can I continue curative treatments while in hospice? The hospice philosophy of care focuses on providing comfort to people. In most cases, patients must stop curative care before enrolling in hospice. If I choose hospice care, do I have to leave my home? No, most people get hospice care at home. But, you can still get hospice if you live in a nursing home or are in the hospital. Am I able to leave hospice after I enroll? Yes, you can leave hospice and return to curative care if you choose.